Weeding at top speeds approaching more than 20 weeds a minute, I speed weeded my way through a large garden area called The Shrubbery. I did not stop to choose a special tool and dig up any weeds. I pulled and tugged as fast as I could and if a weed didn't give up its grip of the earth with a solid tug, I cut it off at ground level. Fast, faster, fastest I went, until I had cleared the area entirely of weeds, at least on the surface. 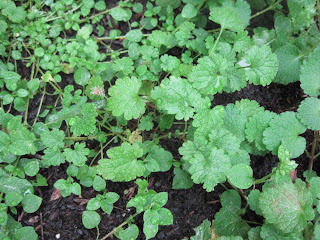 I have no doubt that my satisfaction in seeing that area of the garden weed-free will be short-lived, but I don't care. I wanted that satisfaction, and I didn't want to wait. I told myself as I speed weeded that I would return sooner rather than later to pull out the new weed sprouts that will surely crack through the surface in a week or so. Maybe I'll even attempt to dig up their roots the next time. I make no promises that I will, though, even to myself. I know that if my past behavior is an indication of what I'll do in the future, and it is, I really won't try to dig out those weed roots. But I'll be happy to say that I will try, time and weather and my mind permitting. I identified some of the weeds as I pulled them. There were plenty of thistle, some lamb's quarter, my ol' nemesis purslane, and too many mulberry saplings. There was some dreadful nutsedge and foxtail tall enough to tickle my chin if I reached over it to grab another weed. And standing large and unafraid was a giant pokeweed. Pulling and cutting, none of the weeds were safe from my speed weeding. Speed weeding isn't for everyone. It doesn't work for perfectionists, who would be bothered by knowing those roots are still there. I have news for them. Even if they take the time to choose the perfect tools to dig up their weeds, they'll never get them all. Speed weeding doesn't work for the timid. There is no time to look at each plant and ask "friend or foe" before pulling it. When you are speed weeding, if you pull up a good plant, and you are likely to do so at least once, you just immediately replant it, pat the soil around it, apologize and move on. When you are speed weeding you also don't need to worry about garden fairies. They'll move on quickly when they see what you are doing. They won't risk getting caught up in a weed and being thrown into a basket and then onto a compost heap. They won't try to steal your tools or push you over when you are kneeling on the ground pulling weeds. I love an evening of speed weeding and being able to see progress right away. Too much of life deals with what we can't see, and it is difficult to know if we did good, made enough progress, or went fast enough. With speed weeding, you know right away that you are making progress, you can measure your speed and you can see that the garden is better when you are finished. I think I'll do some more speed weeding tomorrow. Oh, I pulled ragweed today. Made me feel good. You always write such funny posts Carol, i'm one of those perfectionist gardener's i have to dig it out roots and all but i dont use any fancy tools. Wow! I'm impressed... truly. I think this should be an Olympic Event. Too funny! Not a perfectionist by any means, I fall more into the sloth category so any weeding is good weeding in my book! I like to speed weed especially with all the mosquitoes in my backyard. I almost pulled up a young avocado tree the other day from a pot of horsetail. I noticed the large seed the plant was connected to and made the connection just in time! I'm not sure I do anything in a speedy manner in the garden, but I can see the appeal. Most of the time I see something and pull it whle inspecting the beds. Occasionally I sit or kneel down and have a intensive weeding session in a particular area. I am a good speed weeder, but using hedge trimmers on an especially bad area with large weeds is extremely rewarding. I started out my gardening life as a perfectionist, but have gradually come to see there is a time and place for speed weeding. And the earth doesn't swallow you up for not getting every root. They are at least weakened for the next round and not setting seed. I spent last weekend at my daughter's house in Tulsa and had a fine time pulling purslane out of the petunia beds. It's nice to work in a loamy soil instead of clay! What is the weed in your photograph? It is coming up in our lawn. Hundreds of thousands of these little buggers. Thanks!